Fast & Easy Fat-Quarter Potholders - free project! Hi! Happy National Sewing Month! 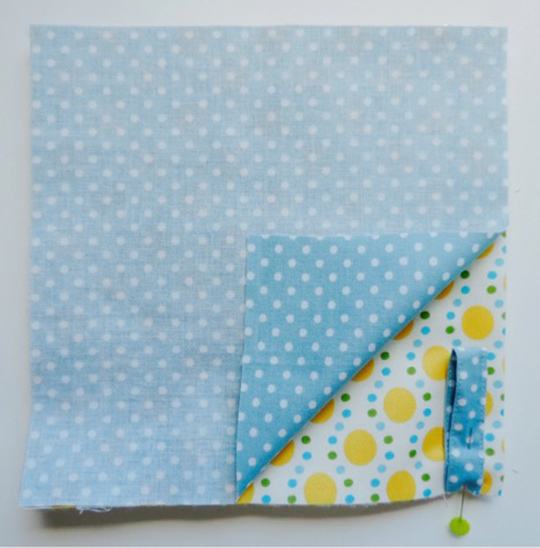 I am Kate Colleran and my book with C&T Publishing is Smash Your Precut Stash!–a book with thirteen different quilt projects in it. 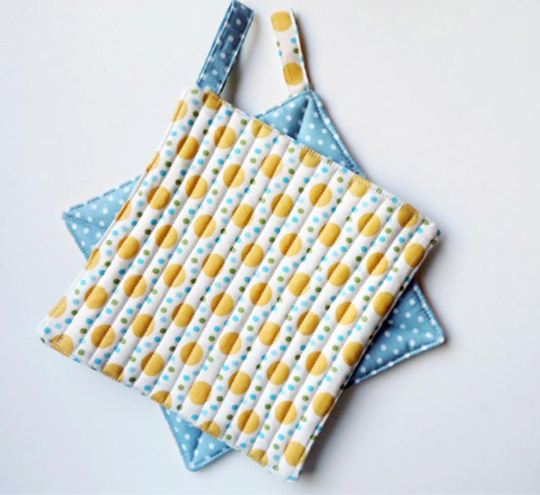 Since it is sewing month, I thought I would share with you a quick and easy potholder pattern. All you need are basic sewing skills and some fabric. And because my book is all about using your precut stash, my potholders started with a couple of Fat Quarters! Aren’t they cute? They were impulse buys. I bought them at two different times, from different quilt shops, with NO idea what I was going to use them for. So I made these. They were made from two Fat Quarters; you can actually get four potholders from two Fat Quarters. So, two for you and two for a friend! Batting–I like a nice thin cotton batting but you can use what you have leftover from other projects. Note: if I am not using Insul-Fleece, I like to use 2 layers of batting. First let’s make the tab. Fold the 2 ½˝ x 8 ½˝ tab in half along the long edge, right sides out. Press the folded edge. Open the strip back up and fold the long raw edges into the center. Press. I like to stitch down the long sides, about ⅛˝ in from the edge. It gives the tab a nice, finished look and closes up the open edge. You can trim the tab to the length you like; some leave it at 8 ½˝ long, but I like mine about 5 ½˝-6˝ long. Layer 1 square from each fabric*, right sides together on top of the batting (and the Insul-Fleece). 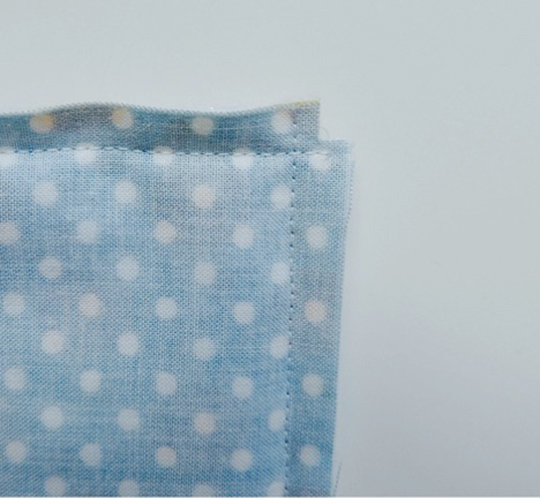 Fold a tab in half and tuck it in between the 2 layers of fabric, about ½” away from one of the corners, raw edges even with the raw edge of the fabrics. *Note: I made all my potholders using 1 square of each of the 2 fabrics. 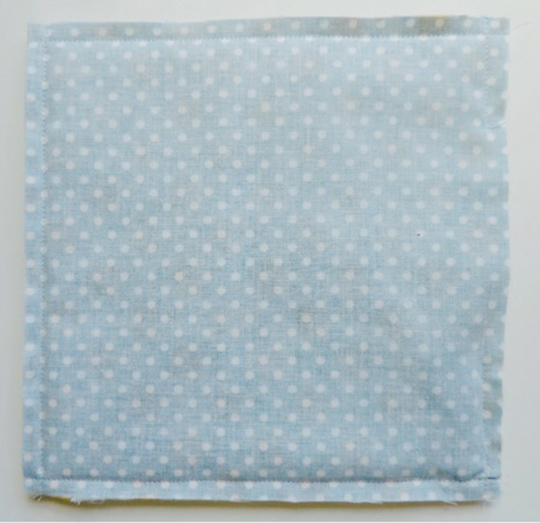 You can also use 2 squares of the same fabric for each potholder: your choice! Using a walking foot, stitch all around the edges of the square, leaving open about 3 ½˝ in the middle of one side for turning. I used the edge of my walking foot as the width of my seam allowance, so for me, that is about ⅜˝. Trim the batting and the Insul-Fleece in the seam allowance to about ⅛˝. This makes the seams less bulky. Trim the corners. I like to trim my corners as a little square cutout versus trimming off a diagonal corner. Then turn the potholder right sides out through the opening in the side. Use your turn poky thing to push out the corners. If you don’t have an official turning tool, a crochet hook or a wooden chopstick works well for this. Fold in the edges of the opening and stitch closed. You can hand stitch or machine stitch closed. I machine stitched all around the edge of my potholder, about ⅛˝ in from the edge. I like to quilt my potholders. It holds the layers together so things don’t shift after washing. You can do a little bit of quilting, or a lot. It is up to you! Now, go make the other 3 and… voila! Four potholders finished in no time! For more precut projects, check out my book, Smash Your Precut Stash. You can visit with me and see what I am up to at my blog seamslikeadream.com/blog. Plus enter to win a free copy of Smash Your Precut Stash right here: a Rafflecopter giveaway! Winner will be announced one week from today; US winner will receive a physical copy and international winner will receive an ebook. Congratulations to Vicki T., winner of our giveaway! We hope you enjoy finding new ways to use up your stash, and thank you so much to everyone else who entered!